Learn how to set up an A/B split test in Listrak Conductor to examine performance of different subject lines, offers, creative, and more. One popular feature of the Listrak application is the ability to split test. You can split test all sorts of variables in your campaigns such subject lines, incentives (offer versus no offer), timing, how the call to action button looks-- the sky is the limit. Using Listrak Conductor, you can set these tests up on your own. Simply follow the below instructions. 3. Then Modify Existing Field Group. 4. Click the ShopperInfo group. 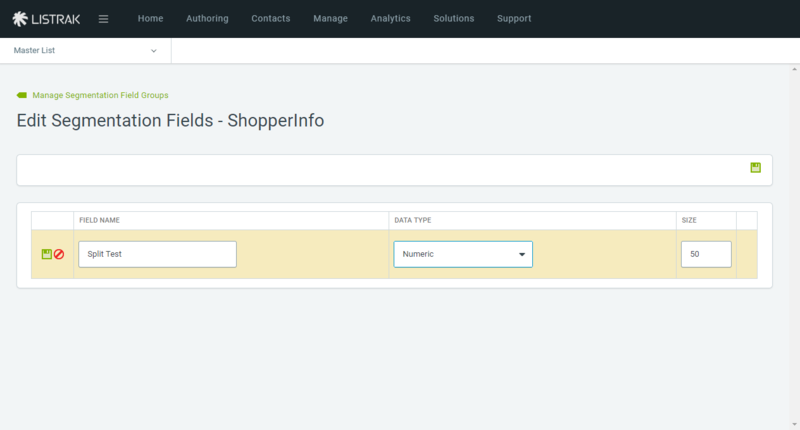 NOTE: The group for Shopping Cart Abandonment is "ShopperInfo," which is the solution we are using for this example, however, the appropriate field group will depend on the solution you are split testing. 5. Create a new segment and call it "Split Test." 6. Select Numeric for the data type. 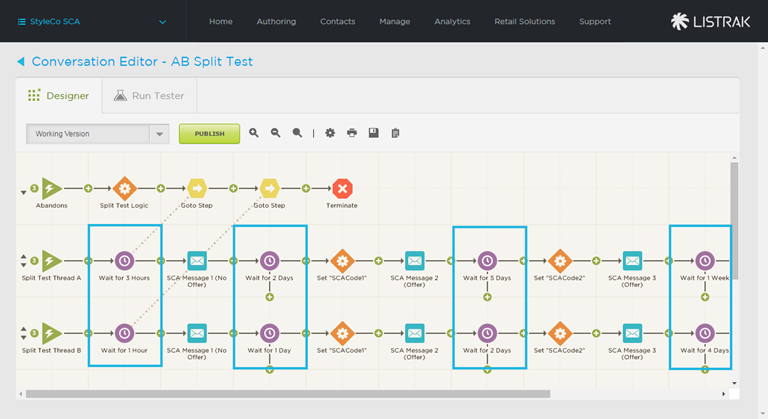 For this example, we'll split test the timing on a Shopping Cart Abandonment campaign. Your existing conversation should already contain a thread and we can think of this initial thread as the "A" thread. In this case, the existing thread is the abandoned carts thread. We need to create two additional threads to the conversation: The first thread, the test logic thread, will contain the logic and Goto Steps for the split test. The second thread will become the "B" thread for testing purposes. The "B" thread contains different subject lines than our initial thread. Right now there's nothing in this thread. What we need to do here is essentially duplicate or recreate the A thread, modifying our test criteria (in this case, timing) to create our "B" group. It is best practice to only test one set of criteria at a time. For example, you wouldn't want to test subject line and timing, because you'd truly have no proof of which affected the buyers' decisions. Add two new threads by clicking the Add Thread icon. Using the Move Up icon, position the test logic thread at the very top. Position the "B" thread after the existing "A" thread. 1. Starting with the test logic thread, click the Trigger Step and rename it "Abandon." 2. 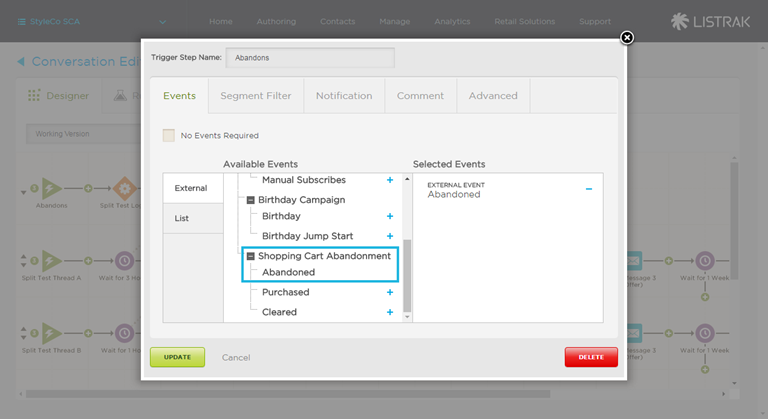 Add the external event for Cart Abandonment by clicking the blue plus sign next to Abandoned in the available events list. 4. Add an Action Step after the Trigger Step. 5. Click the Action Step and define the action. Override the default name and rename this step "Split Test Logic." 6. 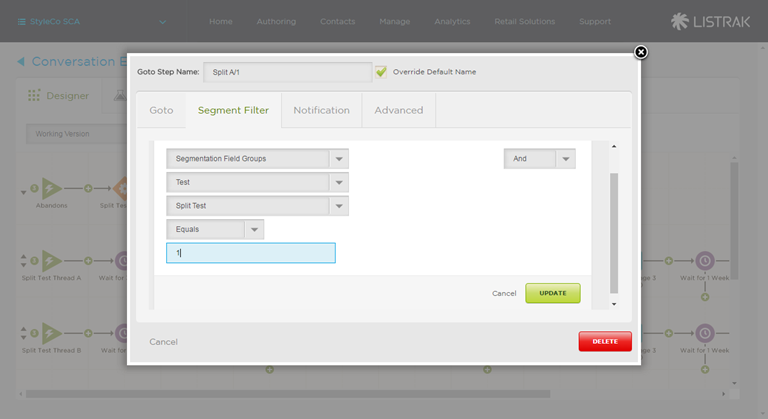 Select Create Split Segmentation from the drop-down menu. 7. 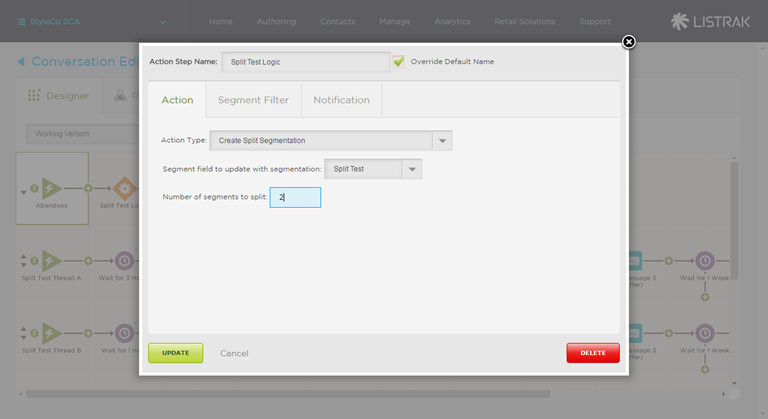 Then select the "Split Test" segment we created earlier from the segment field to update with segmentation drop-down menu. 8. In a traditional A/B split test, we'll test two segments. Enter a "2" in the number of segments to split field. 10. Add two Goto Steps to the test logic thread. We'll get back these steps later on. 11. Click the Trigger Step in the "A" thread (remember, this is the thread that already existing in the conversation when we started). 12. Select the No Events Required checkbox. 13. Rename the thread "Split A - Timing." In this example, we'll test timing, however, you can select a name based on your testing criteria. 15. Duplicate the initial thread by adding the same steps and message. Make sure to change your test criteria. 16. 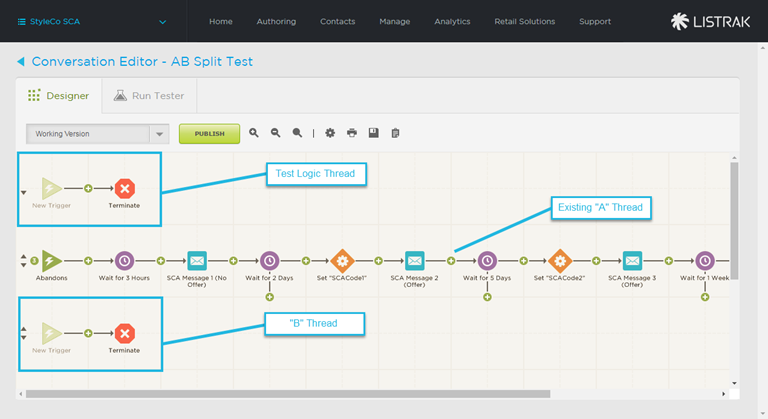 Click the thread "B" Trigger Step and rename the thread "Split B - Timing." Your threads should look something like the below image. Our "A" and "B" threads are identical except that thread "B'" has a much quicker cadence. 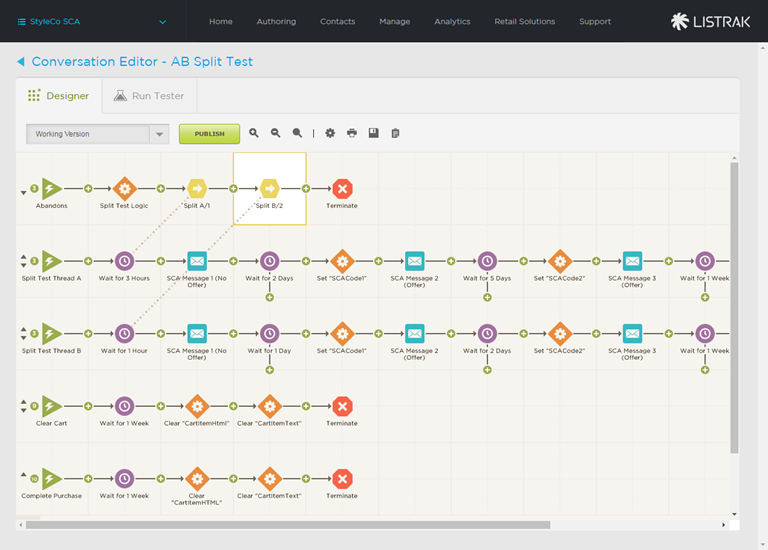 To tie everything together, we need to go back to the test logic thread and update our two Goto Steps. Click the first empty Goto Step in the test logic thread. Rename this step "Split A/1." In the Goto tab, select the first Wait Step in thread "A" as your destination. Click back into the step. Click the Segment Filter tab. Enter in the number 1. Now, each customer that is randomly assigned a 1 by the system will be directed to thread "A." 13. Click the second empty Goto Step in the test logic thread. 14. Rename this step "Split B/2." 15. In the Goto tab, select the first Wait Step in thread "B" as your destination. 17. Click back into the step. 18. Click the Segment Filter tab. 19. Select Segmentation Field Groups. 22. Select the operator Equals. 23. Enter in the number 2. Now, each customer that is randomly assigned a 2 by the system will be directed to thread "B."